Here we put the spotlight on Blue Frontier, winner in the Cutting IT award category. An end-to-end digital agency that utilises the expertise of its technical, development, design and digital marketing team to deliver bespoke projects to clients. Blue Frontier was established in 2005 and now has a team of 40+ working extensively in both private and public sectors, with large and small businesses and organisations across the UK and worldwide. The team also works in the charitable sector on World Health Initiatives developing technology to fight infectious diseases. Blue Frontier design and build websites, applications, intranets and mobile apps, and deliver digital marketing, technical IT and support services, supporting 200+ business websites, and web environments for the NHS and Councils. The company prides itself on being able to deliver a comprehensive range of services to clients. By keeping the team in-house, Blue Frontier is able to offer support on every aspect of a project, allowing successful teamwork and continuity between services. This means that when they develop a product or deploy a new environment, it is done efficiently, to a high standard and meets each client’s specific requirements. With a strong belief in continuous development, Blue Frontier strives to innovate and improve systems and service offering so that the business is continuously moving forward. High standards across all areas gives customers confidence that they are working with a trusted agency focused on providing the right solutions, efficiently and with added value. Blue Frontier is accredited with ISO 9001 Quality Assurance, ISO 27001 Data Management and ISO 13485 Medical Devices (software development). “Being involved in The Techie Awards is great for us. It gives us an opportunity to talk about all of our work, including the pioneering work we do in global health, and it gives our team recognition for the great work they do every day. We very much appreciate the Techie Awards and The Business Exchange for supporting our industry in such a positive way.” James Fry, Managing Director, Blue Frontier. 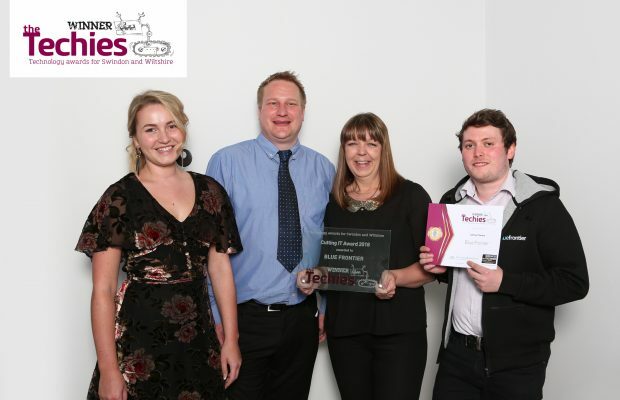 Previous Story Meet The Most Inspiring Wiltshire Companies – It’s Official!